Last summer's release of the long-hidden "28 pages" from Congress' Joint Inquiry into 9/11 and FBI records obtained by Florida Bulldog amid ongoing FOIA litigation indicate that much about Saudi Arabia's role in supporting the 9/11 hijackers remains classified. If the public knew the role the kingdom played in 9/11, would the United States be selling them $350 billion in sophisticated military equipment? Maybe not. Pretty complicated rules. kawika on Fri, 07/14/2017 - 8:53am. So how credible is this guys? wildbill on Sat, 07/15/2017 - 3:11pm. Yea YourNewsWire is 100% actual fakenews junk click-bate, they create fake stories which sound true but never have an actual source. Tricked me a few times as well lol! Dem Bruce Lee Styles on Sun, 07/23/2017 - 8:32am. Unfortunately, yournewswire isn't a credible site. The work is done by a single employee with the help of some contractors. While his work seems to be largely fictional, it does pick up on undercurrents in the reading population. This article--while apparently completely false--does probably reflect a lot of interest by the public in this subject. Pecosin Rat on Tue, 07/18/2017 - 10:28am. We have a former Senator who was the co-chair of the Joint Congressional Inquiry into 9/11, and a respected journalist, posting on a respected (12 Pulitzer Prizes) news outlet's site that "vast numbers of investigative and intelligence documents related to 9/11 remain classified. 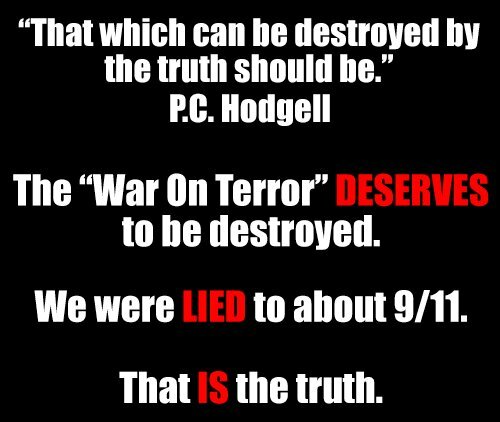 The FBI alone has acknowledged it has tens of thousands of pages of 9/11 reports that it refuses to make public. To make matters worse, agencies withholding information tell what are essentially lies to make their actions seem as acceptable as possible," and NO news outlet is willing to report on it as of this date. Russia, Russia, Russia, Russia, Russia, Russia, Russia, Russia, Russia, Russia, Russia, Russia, Russia, Russia, Russia, Russia, Russia, Russia, Russia, Russia, Russia, Russia, Russia, Russia, Russia, Russia, Russia, Russia, Russia, Russia, Russia, Russia, Russia, Russia, Russia, Russia, Russia, Russia, Russia, Russia, Russia, Russia, Russia, Russia, Russia. Jon Gold on Sat, 07/22/2017 - 8:19am. Jon Gold on Sat, 07/22/2017 - 5:08pm. Better at googling than the news. Jon Gold on Sat, 07/22/2017 - 9:54pm. .. because Putin didn't write it. dtg86 on Mon, 07/24/2017 - 4:46pm. Jon Gold on Mon, 07/24/2017 - 7:07pm. TomT on Mon, 07/24/2017 - 9:07pm. Jon Gold on Mon, 07/24/2017 - 7:15pm. Jon Gold on Mon, 07/24/2017 - 7:18pm. Photos I posted are just something I've been farting around with. What passes for "newsworthy" these days is a joke, and I was trying to make a point. Jon Gold on Mon, 07/24/2017 - 7:22pm. Jon, I like the graphcis!! TomT on Mon, 07/24/2017 - 9:06pm. Jon Gold on Wed, 07/26/2017 - 12:01pm. Remember that story of U.S. Led Forces using White Phosphorus in Raqqa? Whatever happened to that story? 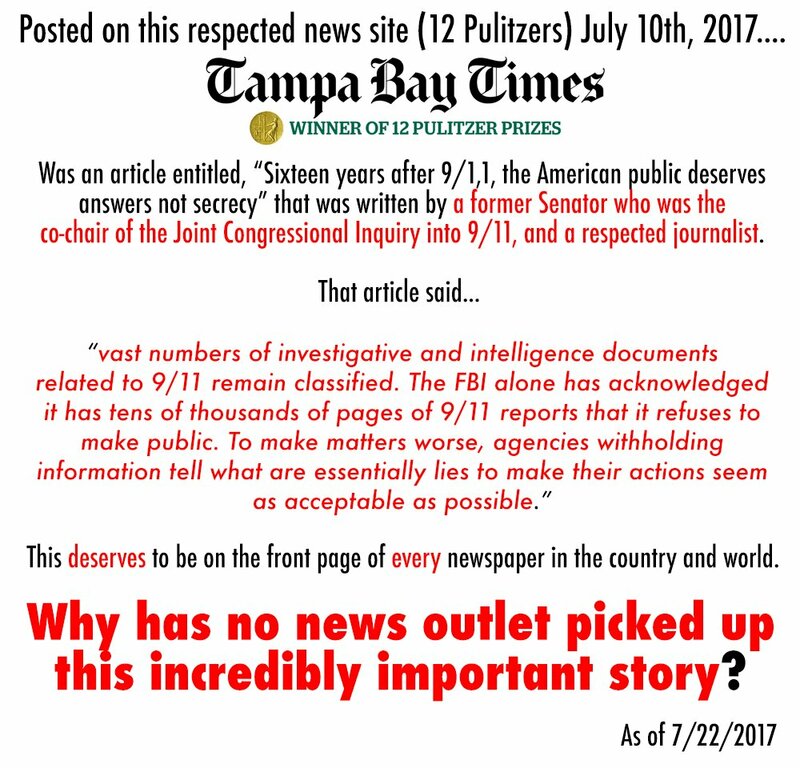 Whatever happened to that story that was reported on by one news outlet in this country (the 12 Pulitzer Prize winning paper, the Tampa Bay Times) that said "vast numbers of investigative and intelligence documents related to 9/11 remain classified. The FBI alone has acknowledged it has tens of thousands of pages of 9/11 reports that it refuses to make public. To make matters worse, agencies withholding information tell what are essentially lies to make their actions seem as acceptable as possible?" Whatever happened to that story that broke today that said "MISSING pages from a heavily censored internal FBI report on 9/11 contain explosive information on Saudi Arabia’s role in the 2001 terrorist attack, according to a group of investigative journalists?" I made this picture of Jan saying "Russia, Russia, Russia," for fun, but there is NO DOUBT in my mind that Russia is a big distraction. Jon Gold on Wed, 07/26/2017 - 2:01pm. Jon Gold on Wed, 07/26/2017 - 7:18pm. Would be nice to have a source link for some of these graphics and this one in particular that we can more easily pass around on social media sites. Any Imgur.com links or other familiar hosting sites? Orangutan. on Mon, 07/31/2017 - 10:23am. On the image to the get the image location. That's what I did in order to post them here. Jon Gold on Mon, 07/31/2017 - 1:54pm. Orangutan. on Fri, 08/04/2017 - 2:05am. Or any image site to store images. Jon Gold on Fri, 08/04/2017 - 10:45am. Jon is right about the "right click"
After the right click, the menu appears. The URL for the image will show under properties. TomT on Sun, 08/06/2017 - 9:02am. Jon Gold on Fri, 07/28/2017 - 12:02pm. The possibility SHOULD NOT be ignored. 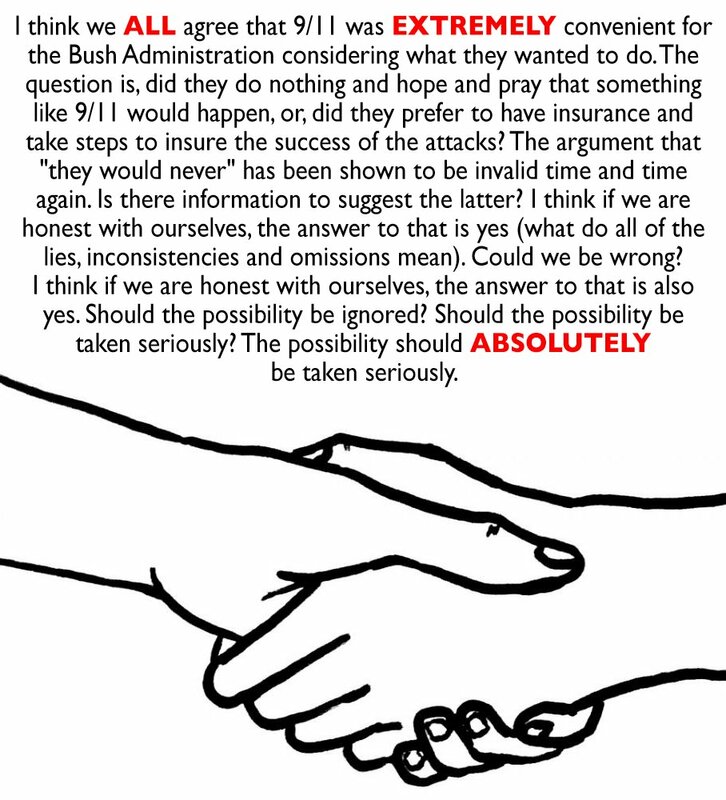 I think we ALL agree that 9/11 was EXTREMELY convenient for the Bush Administration considering what they wanted to do. The question is, did they do nothing and hope and pray that something like 9/11 would happen, or, did they prefer to have insurance and take steps to insure the success of the attacks? The argument that "they would never" has been shown to be invalid time and time again. Is there information to suggest the latter? I think if we are honest with ourselves, the answer to that is yes (what do all of the lies, inconsistencies and omissions mean). Could we be wrong? I think if we are honest with ourselves, the answer to that is also yes. Should the possibility be ignored? Should the possibility be taken seriously? The possibility should ABSOLUTELY NOT be ignored. Jon Gold on Fri, 07/28/2017 - 9:31pm. They are the praying kind. Maybe for photo-ops. Jon Gold on Fri, 07/28/2017 - 9:51pm. Jon Gold on Sat, 07/29/2017 - 9:35pm. What's a left handshake? Is this what criminals do when making a sinister bargain? kawika on Mon, 08/07/2017 - 7:53am. To be a symbol for people coming together. Jon Gold on Mon, 08/07/2017 - 9:35pm. Has YET to be covered by any news outlet. Jon Gold on Sat, 07/29/2017 - 9:44am. Jon Gold on Sun, 07/30/2017 - 2:31pm. Jon Gold on Sun, 07/30/2017 - 9:11pm. Jon Gold on Wed, 08/02/2017 - 11:53am. Jon Gold on Thu, 08/03/2017 - 10:14pm. Jon Gold on Sat, 08/05/2017 - 9:19pm. Jon Gold on Mon, 08/28/2017 - 12:42pm.